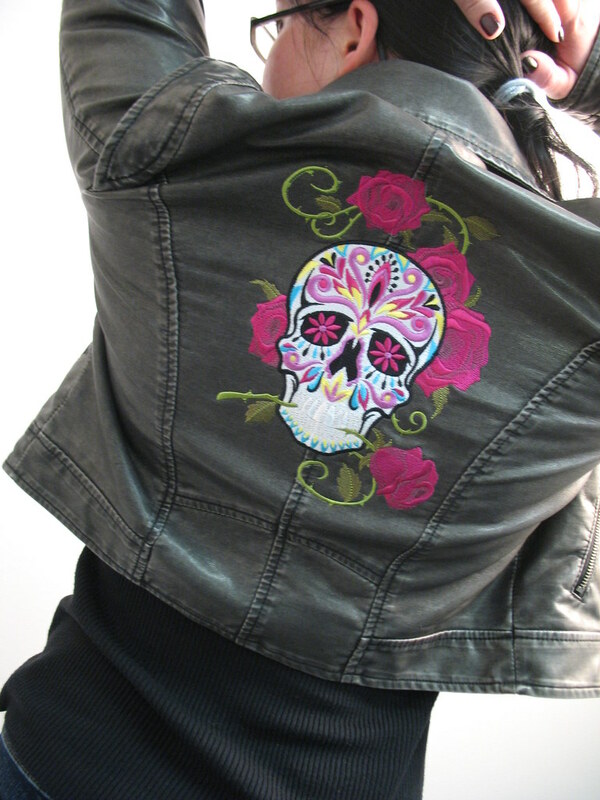 I thought I'd share a rockin' jacket I made for our next ad, the Dia de los Muertos Jacket! Our fabulous Danielle is modelling, and decided the jacket I found and stitched was hers. A battle ensued. Then Karline decided she wanted one. Now we think we might make a bunch and be a little embroidery gang. Whacha think? Anyone got a name for our newly formed rough and tumble embroidery gang? I don't have an idea for a name for your gang... but I definately would fight you for the jacket. I want one now! Great jacket, it looks fantabulous! Love the jacket!! Your gang should be The Flossed, Tossed & Moshed. I'm in awe... is this hand stitched? If you all have jackets like, you'll be the coolest looking gang ever! Organizing my first swap: Go Green Quick and Easy Weekend Swap! Just "bordado". "nombre" means noun. And that skull is gorgeous. To die for.